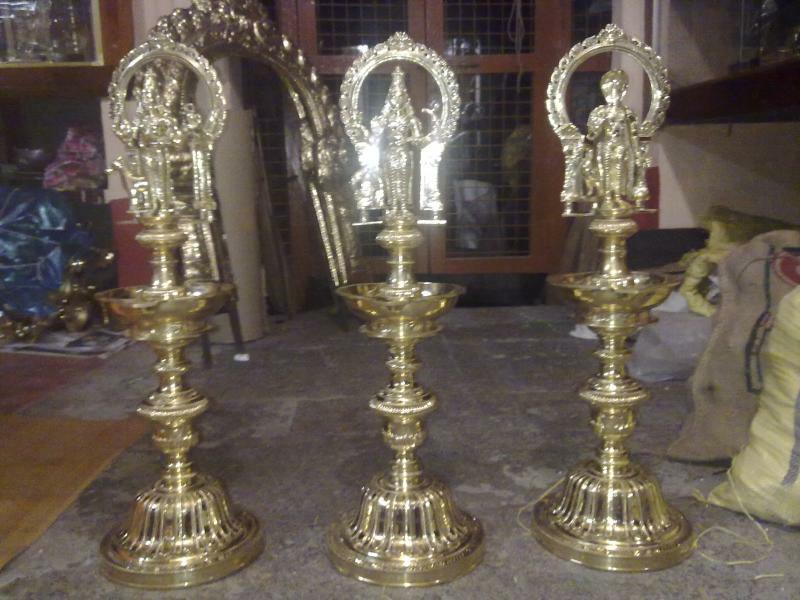 Below listed products are variety of Hand carved (engraved) Traditional South Indian Ornamental Lamp's called as Kuthu Villakku (or) Nagas kuthu Villakku. 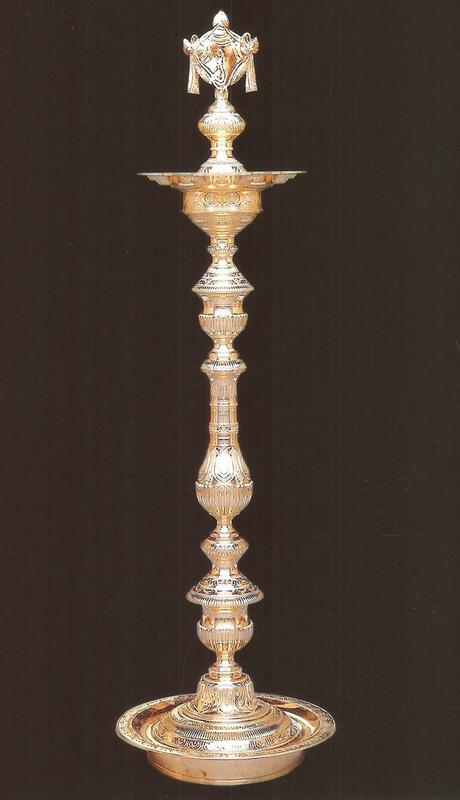 We do 24 caret Electro Gold plating for all our Traditional Lamps with Lacquer coating. 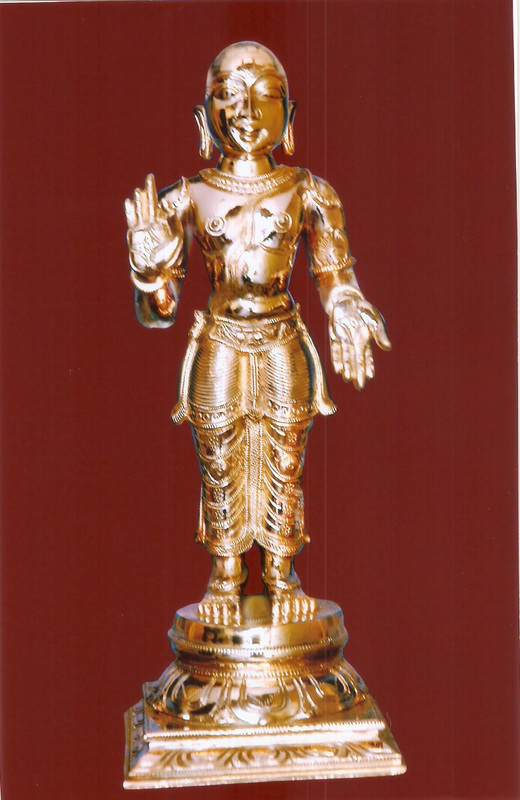 Our electro plating are guaranteed and will issue a Certificate for all our electro Plating. 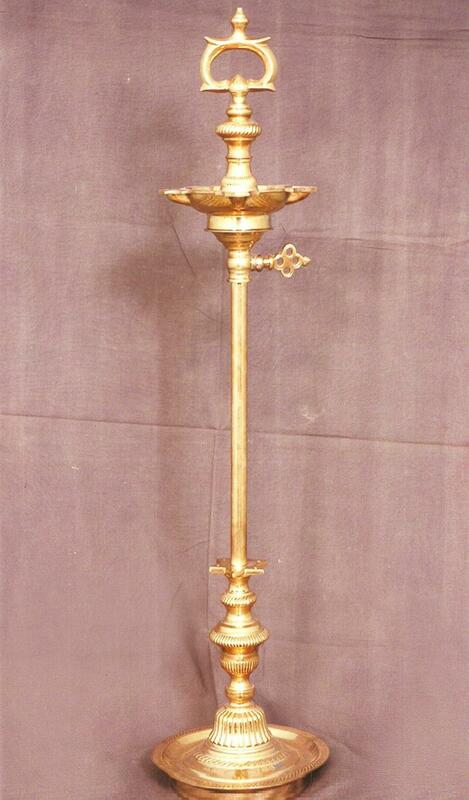 We manufacture small 9" inch gift purpose Lamp to 72" inch Traditional Ornamental lamp for display. 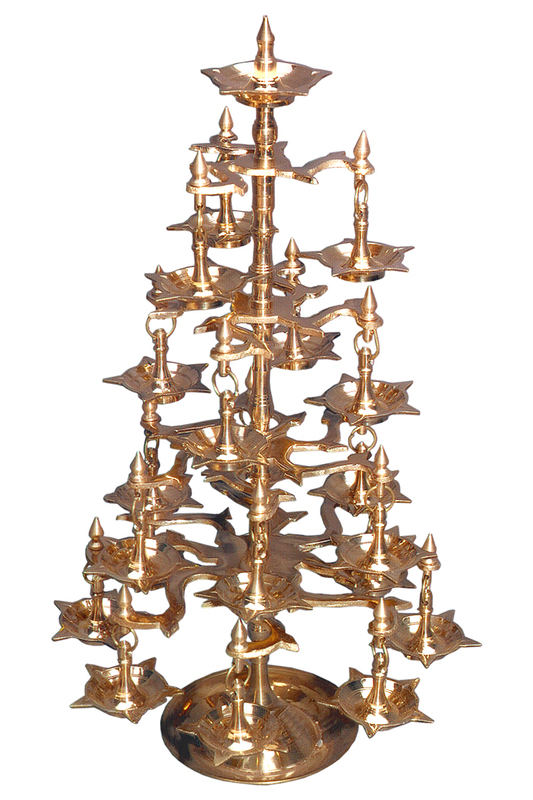 TRADITIONAL BRASS ORNAMENTAL BRANCHES LAMP IS MADE OF PURE BRASS METAL WITH FINE TRADITIONAL ENGRAVINGS. THERE WILL BE THREE STEP'S. 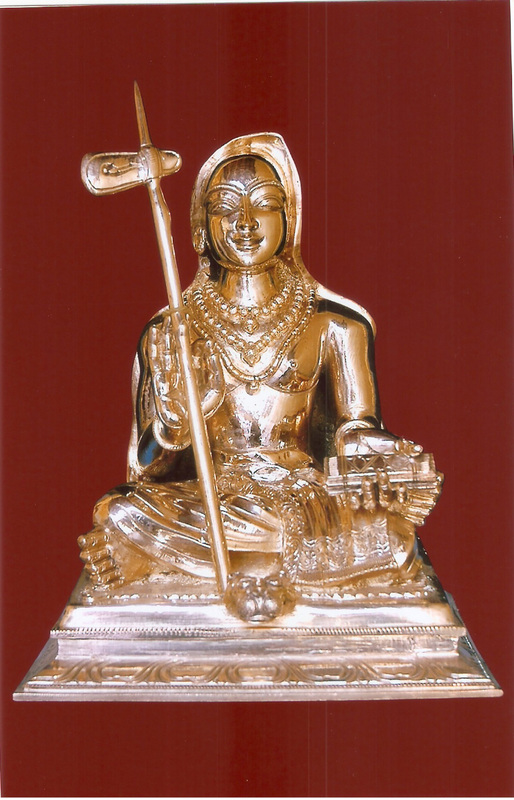 IN EACH STEP THERE WILL BE FIVE BRANCHES. TOTAL 25 BRANCHES. 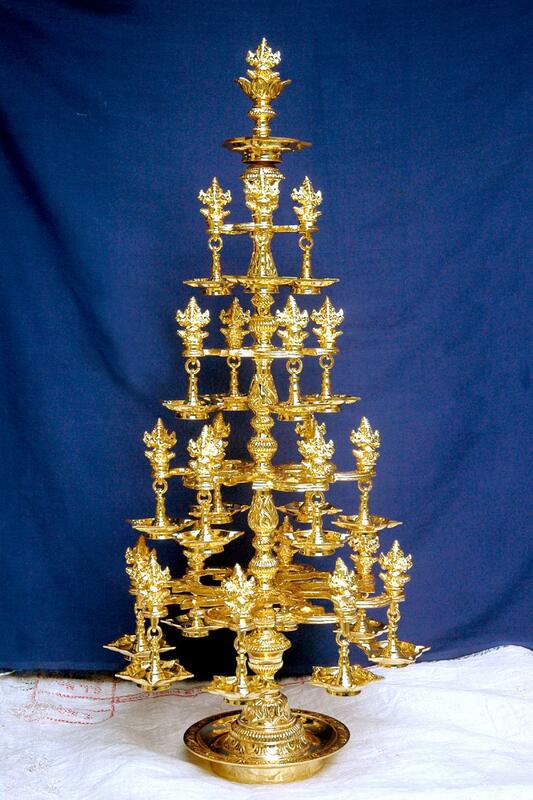 IN EACH BRANCH THERE WILL BE ONE LAMP AT THE TOP AND ONE HANGING LAMP AT THE BOTTOM. 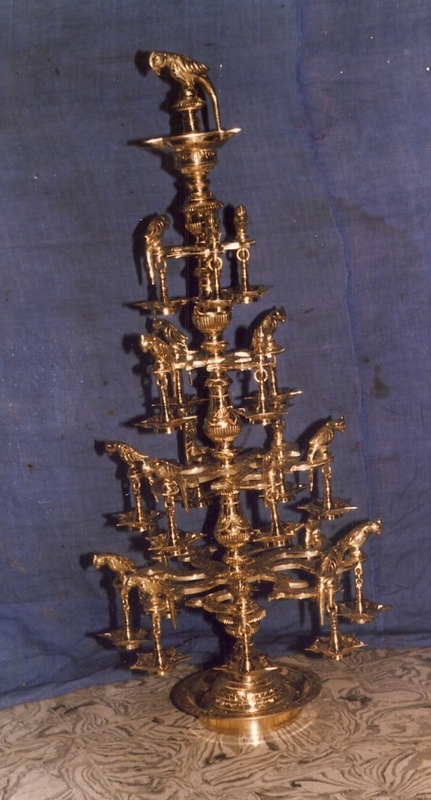 ANNAPAKCHI BIRD ON EACH TOP SIDE LAMP OF THE BRANCH AND ONE MAIN LAMP AT THE TOP. 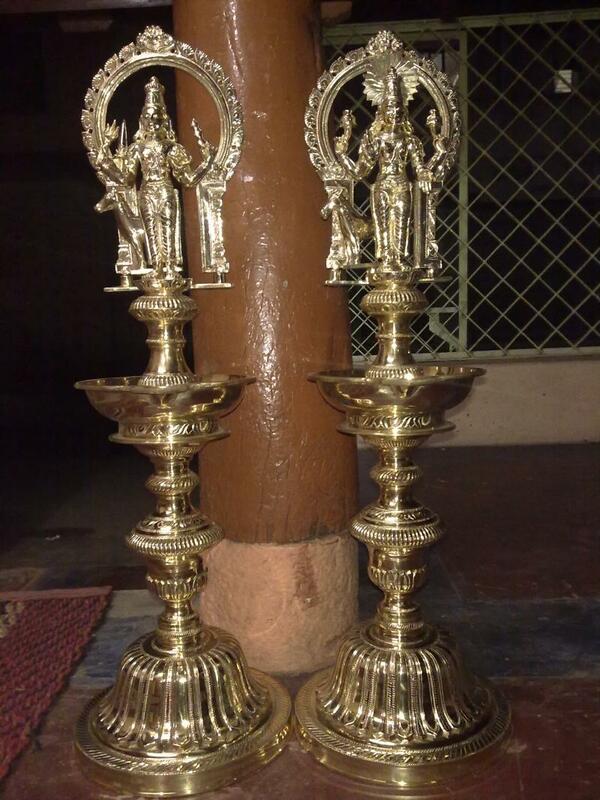 STANDARD SIZE: 4.5 FEET & 5.5 FEET. 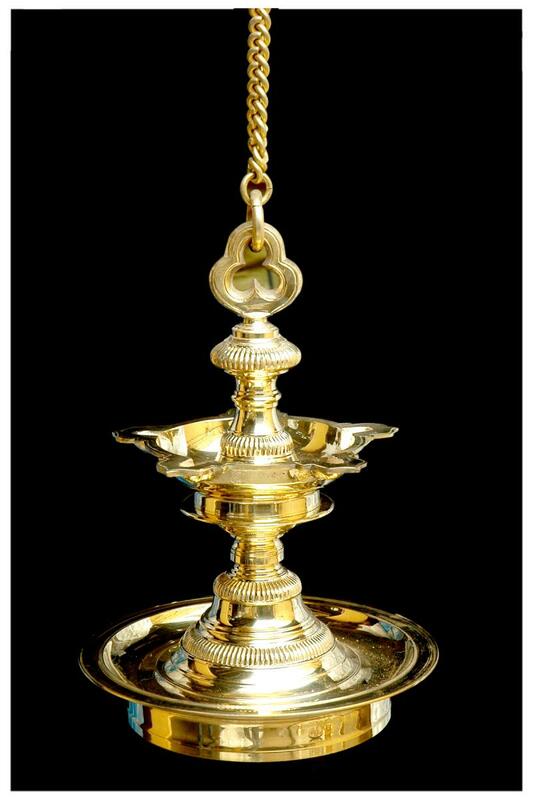 ASHTOTHIRA DEEPAM IS MADE OF PURE BRASS MATAL WITH TRADITIONAL FIINE ENGRAVINGS. 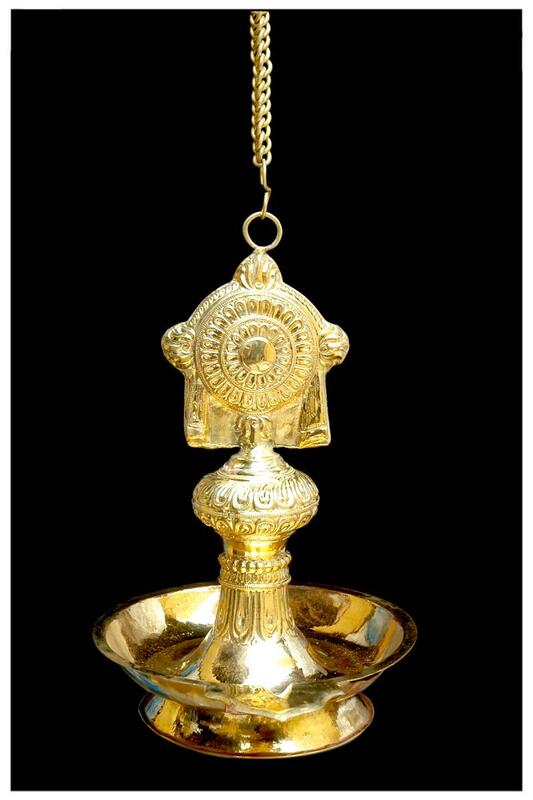 ASHTOTHIRA DEEPAM WHICH MEANS 108 DEEPAM. 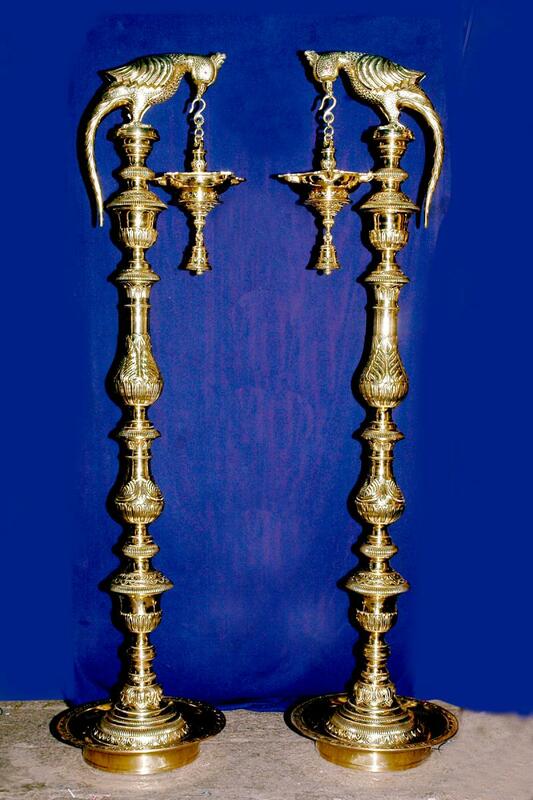 IN THIS LAMP THERE WILL BE FOUR STEP. 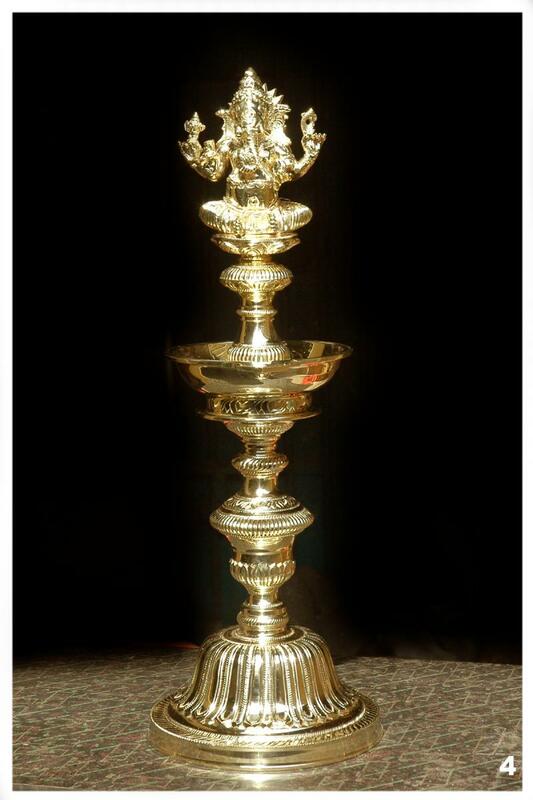 The Ratha Harrathi Lamp is four step lamp with one five have top harathi on top. 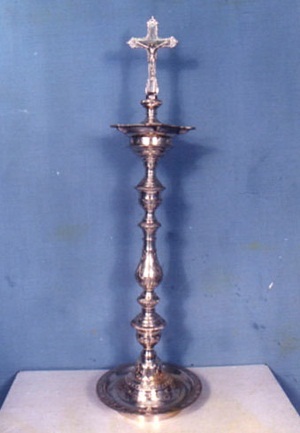 Ornamental Parrot Lamp with Hanging saravillakku with bell. STANDARD SIZE: 2'.6" FEET, 4'.6" FEET, 5'.6" FEEt. 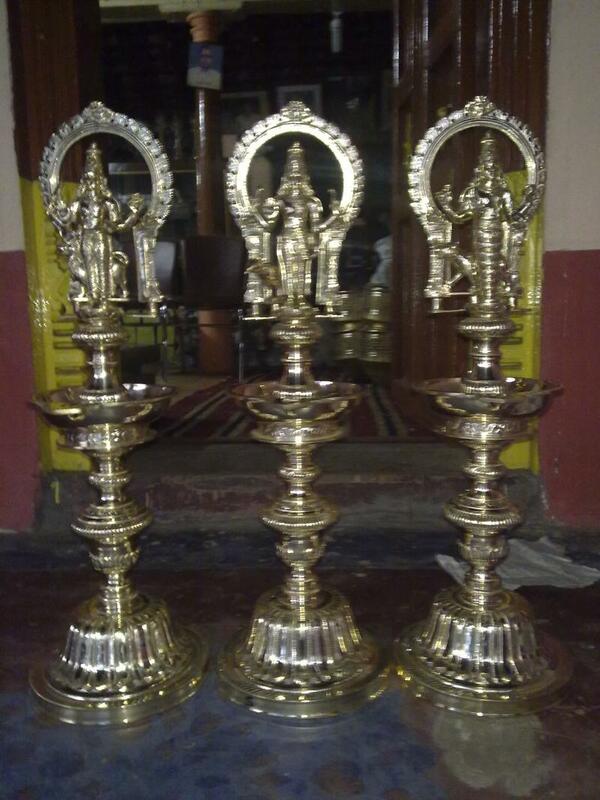 SIZE AVALIABLE: From 1'.0" Feet to 6'.0" Feet (Custom made size) 7'.0" to 9'.0" Feet. 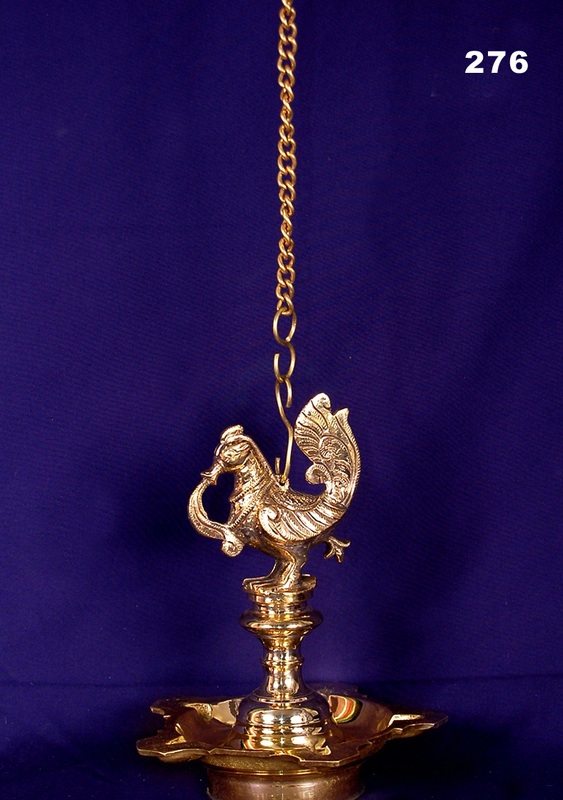 Ornamental Key Lamp standard size 3'.0" Feet can be adjust up to 4'.6" Feet. 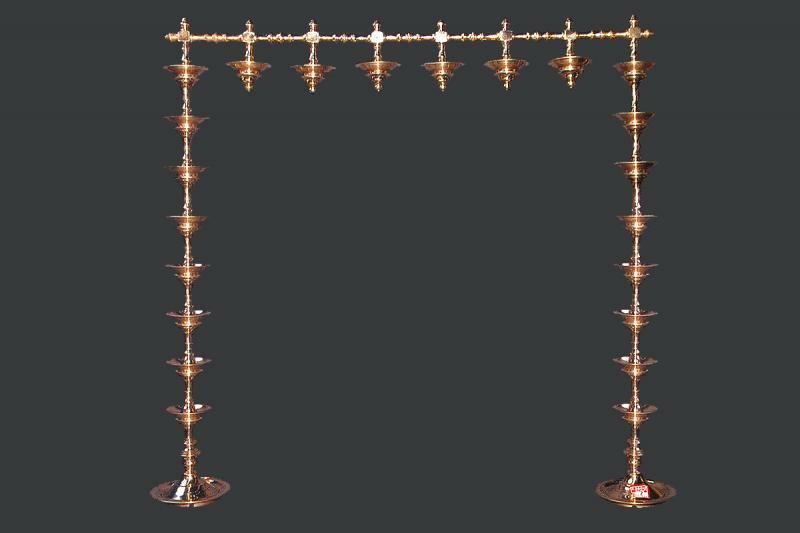 We have wide range of Sara Villakku or Hanging Lamp with Annapatchi, Ganesha, Changu chakkaram. 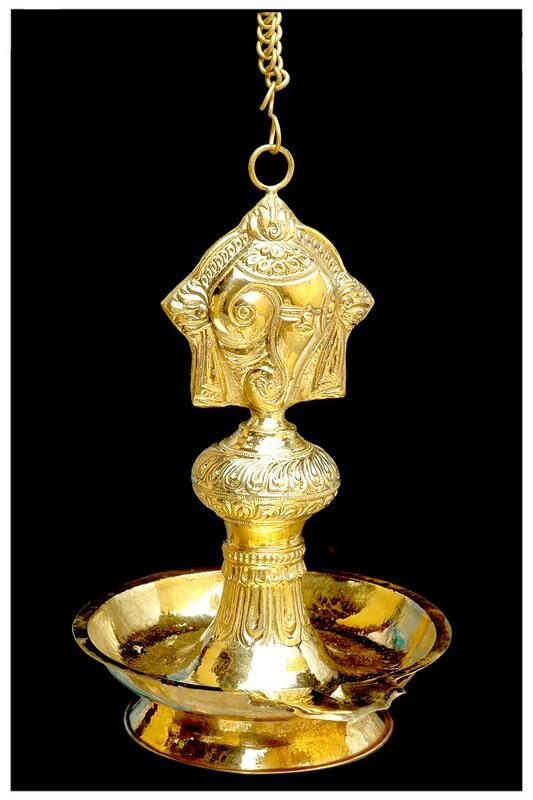 BrassVaasal Maalai a special traditional Lamp with 5 face & round. 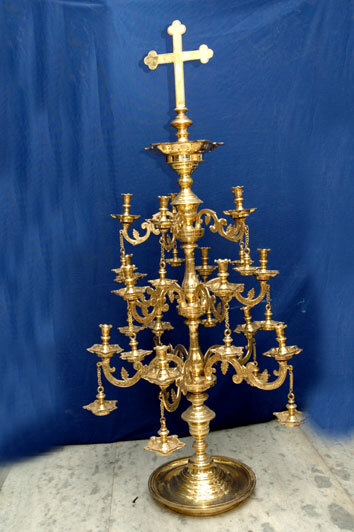 A Iron rod will be fixed to the base plate and then have to fix the brass part one by one and the Horizontal part have to be fixed. 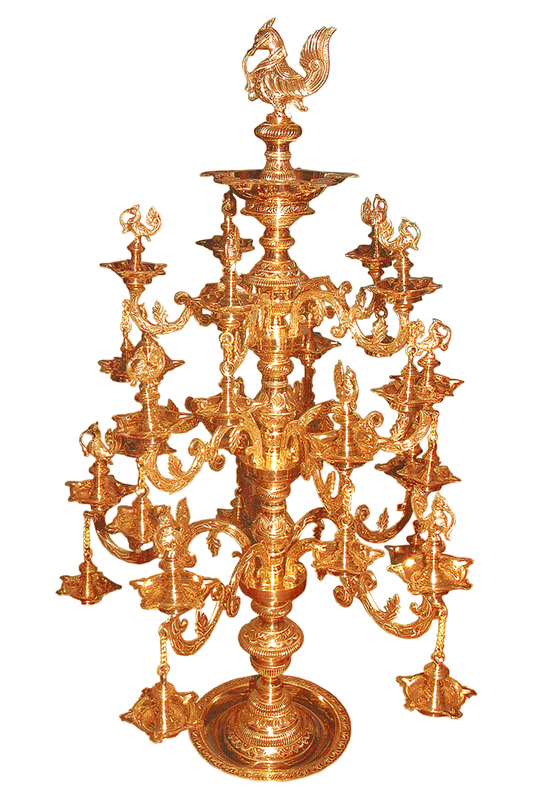 We Manufacture all kinds of Church Candle Holders, Church Lamps, Custom made Church Lamps. 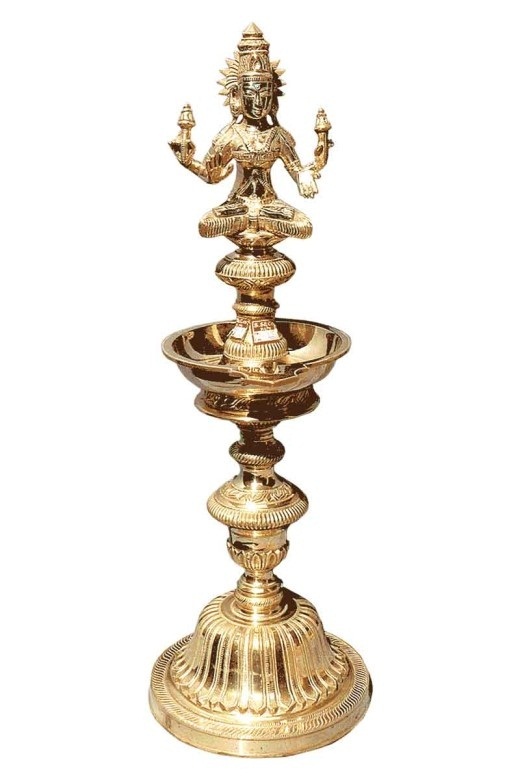 Religion - spirituality - BRASS LAMPS - KUTHU VILLAKKU - BRASS BRANCHES LAMP - BRASS ASTOTHIRA DEEPAM - BRASS RATHA ARTHI - BRASS PARROT LAMP - TRADITIONAL BRASS LAMP - candle stand - brass candle stand - candle holder - brass - lamp - ornamental - oil lamp - brass lamp.